Hey Kelis, I Don’t Get It!? 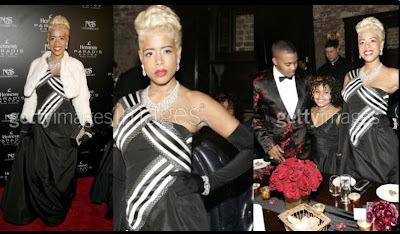 Kelis was the host of Nas’ Album release dinner the other night. If you don’t know what that sentence meant you probably don’t partake in the hip-hop world and that means you’re probably a racist. Nice work. Now how good do you real about yourself? Anyway, I am very confused by Kelis as a whole. Also, is that her natural hair color? I think the technical name for that color is “Gwen Stefani White.” And where the hell does she keep putting her hand? Is that her hip? It looks a little high to me. I think she is more than likely grabbing her rib-cage. Finally, are those white traffic lines from the highway on her dress? She needs to be careful because a drunken Lindsay Lohan could go speeding up Robertson Blvd and mistake her dress for a continuation of the road and then ride right over her! Ok, you may think that it’s a bit of a stretch, but my money is on Lohan. And by “money” I mean $2.14. As a perfect transition…speaking of cars…Kelis is the new spokesperson for Ford’s “Push it to the Edge” campaign. No clue what that means, but she’ll probably get a car out of the deal. By the way, do people even say “spokesperson” anymore? I haven’t heard that title since a 1988 episode of Star Search.